The GoPro line of action cameras generate some amazing footage, but who has time to navigate a search engine to find them? That incredibly inconvenient means of watching first-person bird videos will be a thing of the past later this year, when the GoPro Channel app launches for the Xbox 360 and Xbox One. It's a video browser and online store, all in one. That's right, this channel's utility is twofold. First, you can browse amazing videos all day long, harvesting inspiration. When you are fully inspired, you can visit the store section, where GoPro cameras and accessories can be ordered directly. Orders are fulfilled by Microsoft's online store, marking the first time the company has worked physical purchase of packaged goods into an Xbox app (no, Pizza Hut doesn't count). Mind you the app does require Xbox Live Gold, but that's a small price to pay for the ability to browse videos also found on YouTube and purchase things readily available everywhere else. How much is convenience worth to you? I thought so. 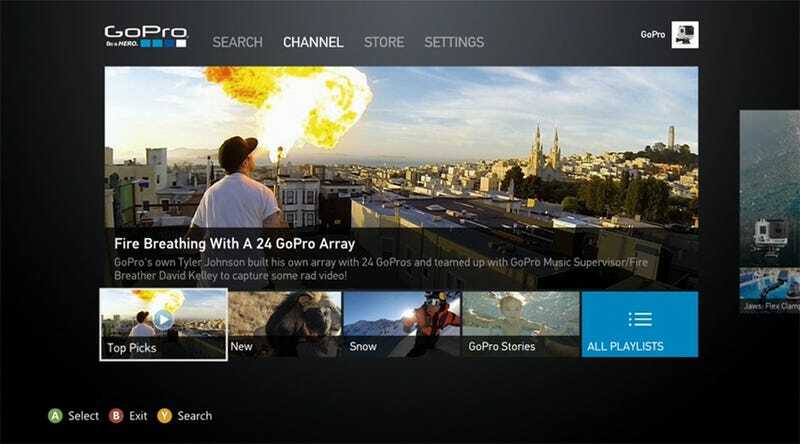 The GoPro Channel app hits the Xbox 360 this spring and Xbox One this summer. I'd hold off purchasing any camera equipment before that, so you can get the full experience.